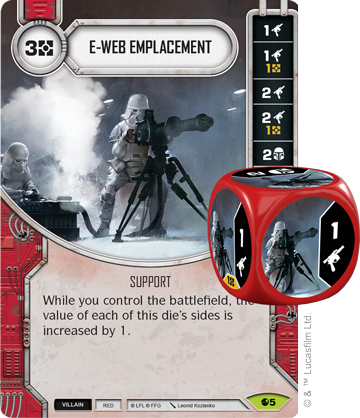 "Our Rebellion is all that remains to push back the Empire,"
The Spirit of Rebellion permeates every part of the galaxy. 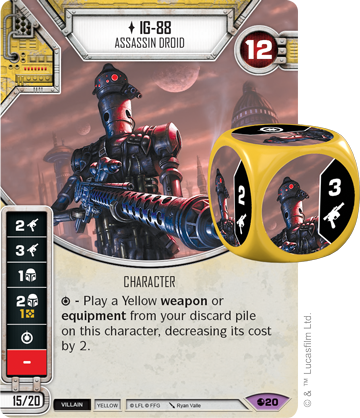 From bounty hunters lurking in shady cantinas to rebel soldiers battling on the front lines of galactic conflicts. From Jedi Knights battling against tyranny to Sith Lords forging their own path. 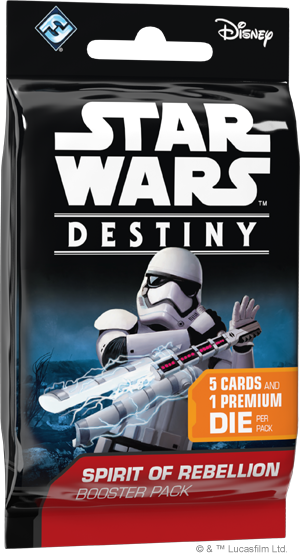 Now, Star Wars™: Destiny players can join the fight themselves; Spirit of Rebellion is now available at your local retailer! 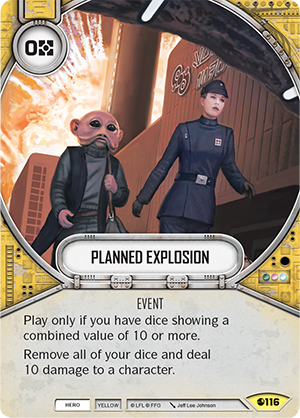 In our preview coverage, we first looked at the Yellow hero cards in Spirit of Rebellion, which not only includes fan-favorite characters like Chewbacca (Spirit of Rebellion, 43) and Maz Kanata (Spirit of Rebellion, 45), but also tricky events like Planned Explosion (Spirit of Rebellion, 116) and powerful upgrades like Lone Operative (Spirit of Rebellion, 49). Though not always packing the most firepower, Yellow characters always have the tools they need to remain a threat. When you have a Yellow hero on the field, your opponent will always have to be wary of what tricks you’re holding in your hand. 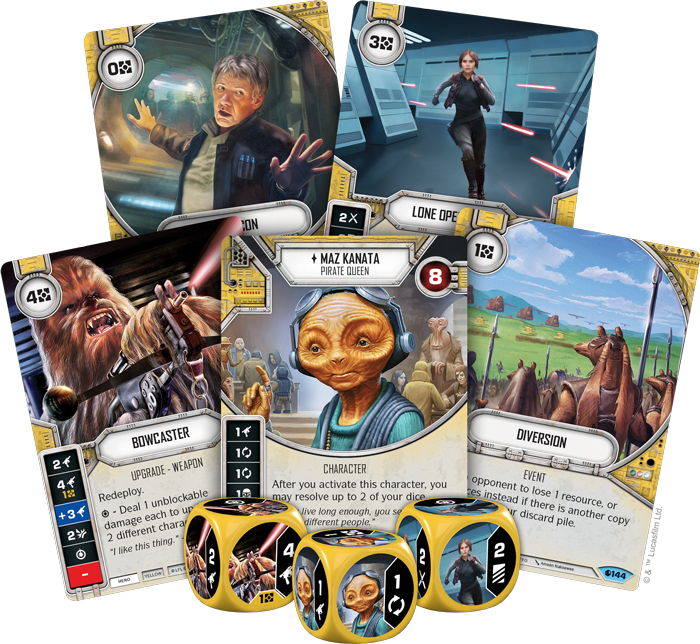 Next we looked at the scum and villainy that populates the Star Wars galaxy with the Yellow villain cards. 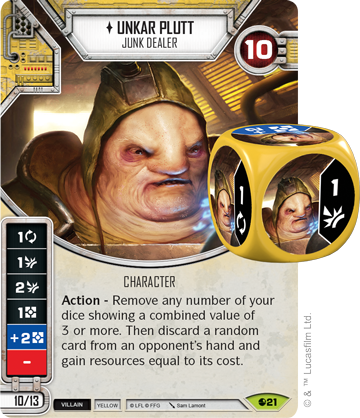 Characters like IG-88 (Spirit of Rebellion, 20) and Unkar Plutt (Spirit of Rebellion, 21) use your resources efficiently, offering discounts on equipment and ways to increase your resources while hurting your opponent. 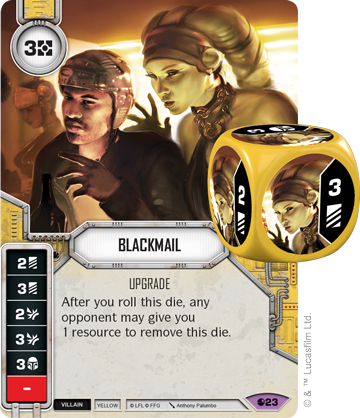 These scum continue to put pressure on your opponent through cards like Blackmail (Spirit of Rebellion, 23), a powerful die that can be mitigated, if your opponent is willing to part with their precious resources. 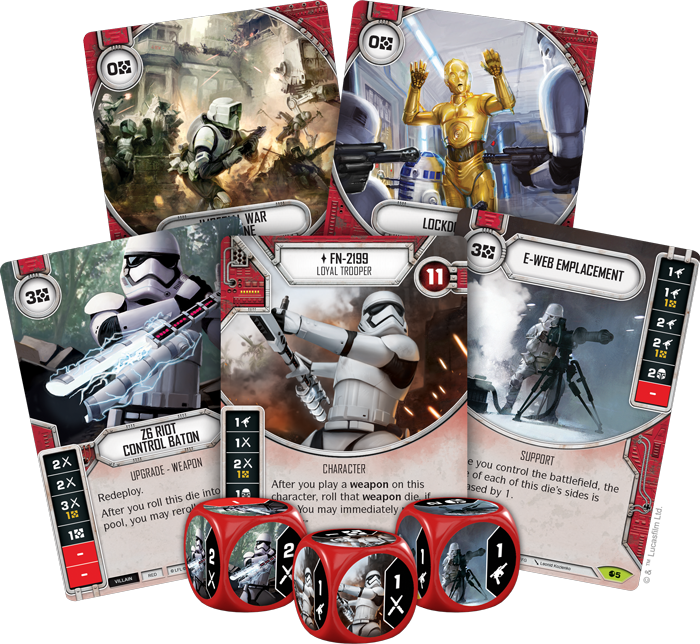 We then shifted focus to the soldiers who fight for the Spirit of Rebellion across the galaxy with Red hero cards. 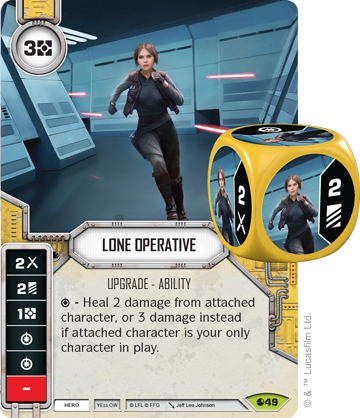 With a mix of soldiers with ranged damage options like Baze Malbus (Spirit of Rebellion, 26) and tacticians to help get you the rolls you need like Mon Mothma (Spirit of Rebellion 27) , Red heroes are a force to be reckoned with in Spirit of Rebellion. 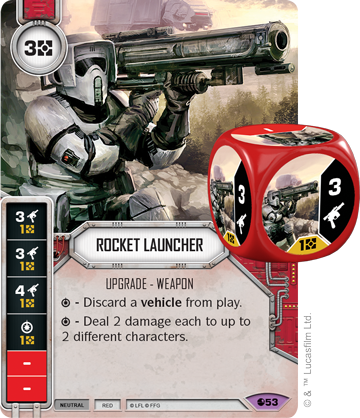 As soldiers on the front line, Red heroes need the proper equipment to get the job done, and cards like Rocket Launcher (Spirit of Rebellion, 53) do just that. 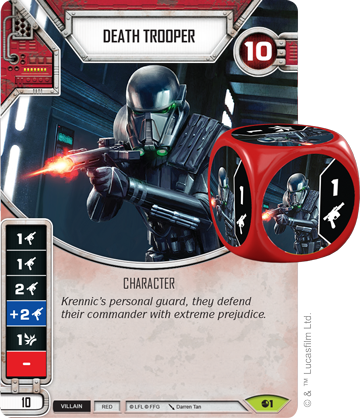 Though it is expensive, the extreme damage Rocket Launcher provides makes Red characters an immediate threat on the battlefield. 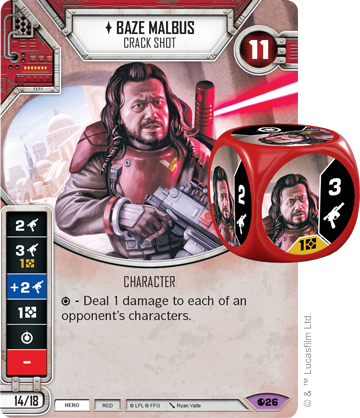 We then took a look at the other side of galactic conflicts with Red villain cards. When these character’s control the battlefield, they become an unrelenting force that is difficult to stand against. 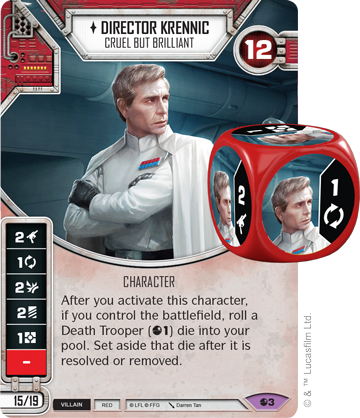 Director Krennic (Spirit of Rebellion, 3) punishes your opponents by rolling an extra Death Trooper (Spirit of Rebellion, 1) die when you are in control of the battlefield, and upgrades like E-Web Emplacement (Spirit of Rebellion, 5) only add to the pressure. 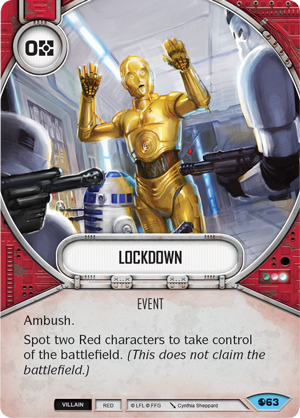 Red villains also receive plenty of tricks like Lockdown (Spirit of Rebellion, 63) to ensure their Battlefield tactics remain consistent. 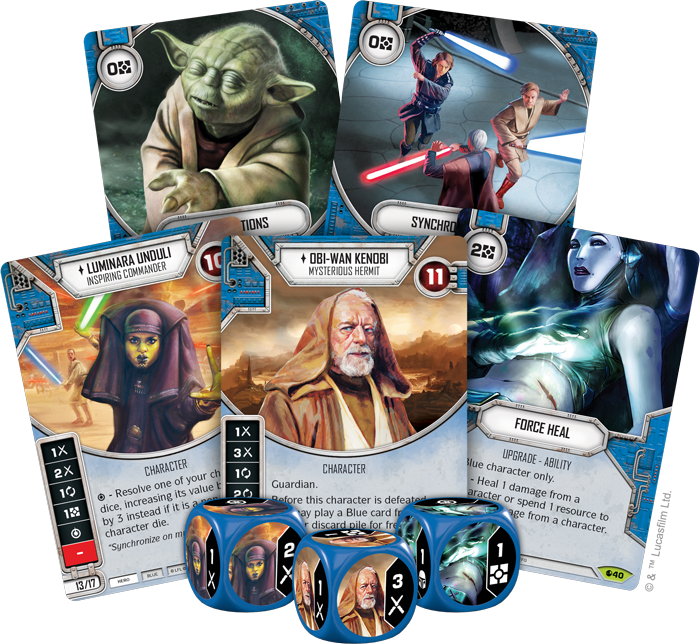 We then took a look at the mystical side of the Spirit of Rebellion by examining Blue Heroes. 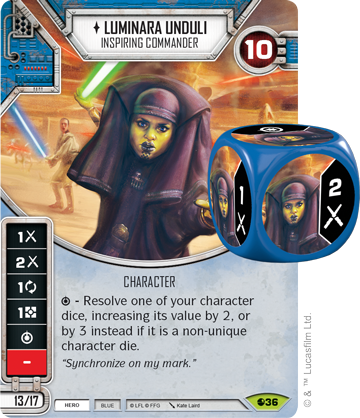 With the Force on their side, these protective heroes can manipulate their dice by increasing their value through characters like Luminara Unduli (Spirit of Rebellion, 36), or use them for other means via cards like Synchronicity (Spirit of Rebellion, 106). 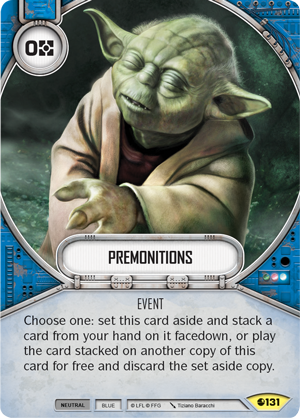 Blue heroes don’t concern themselves with credits when they have events like Premonitions (Spirit of Rebellion, 131) which, with the right timing, can give a major discount on costly cards. 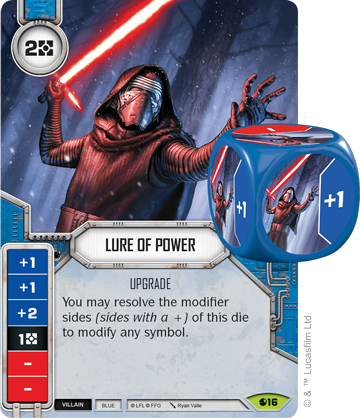 Finally, we examined the Dark Side of the Force with Blue villain cards. 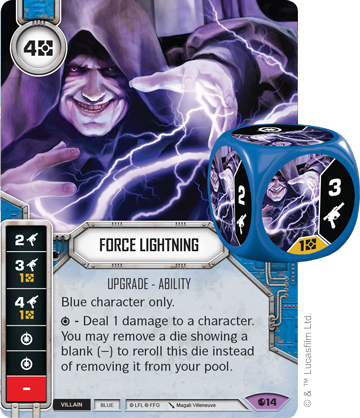 These characters channel their anger and hate into powerful effects for their die. 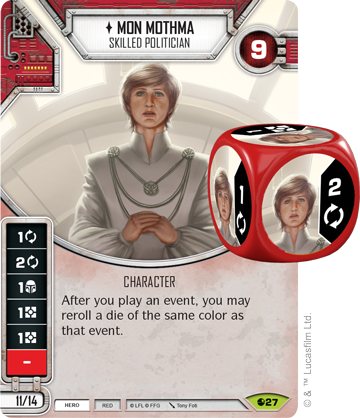 The (Spirit of Rebellion, 16) can modify any symbol on another die, ensuring your dice will be powerful, if not consistent. Blue villains are experts at turning their hate and anger into pure damage. 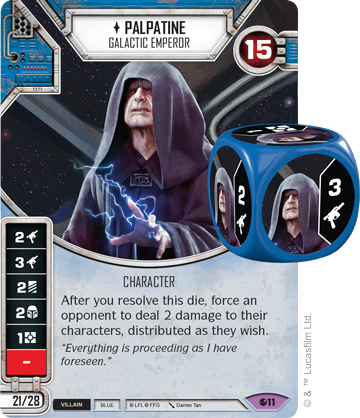 Palpatine (Spirit of Rebellion, 11) is the first character in the game that can form his own team with his Elite Version. 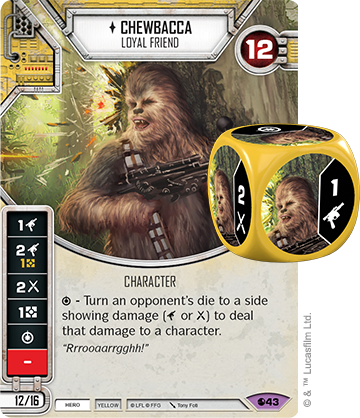 Not only does his die provide plenty of damage sides, but any time you resolve it, your opponent’s characters must take two additional damage distributed among them. 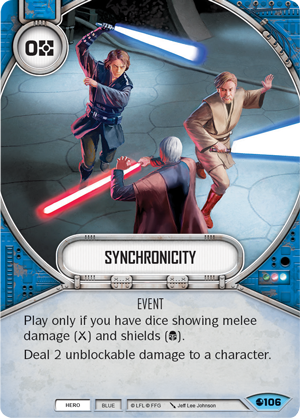 Combined with Force Lightning (Spirit of Rebellion, 14), your foes will be staring down a spiral of damage that seems to never end. 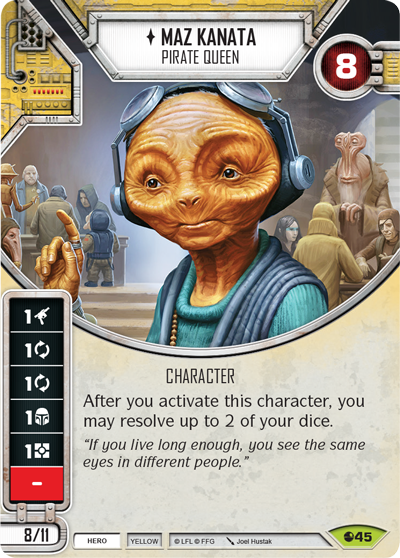 Fulfill your Destiny and pick up Spirit of Rebellion (SWD04) from your local retailer today!